Gareth Hoskins Architects have submitted plans for the refurbishment and expansion of Partickhill Bowling Club to improve the existing clubhouse and garden area and build six new homes within the grounds. Intended to revitalise the club as a community hub offering a wider range of sports and activities the scheme will be financed by the sale of unused tennis courts to property development firm Noah, facilitating the housing component of the plan. 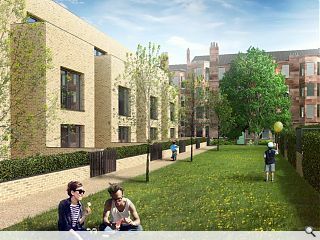 In their design statement Hoskins write: “The proposed scheme is distinct from the surrounding tenement buildings and detached villas and aligned along the mews lane and proposes brick as an appropriate facing material. The proposed development is in a conservation area. I fail to see how this design is respectful to that status. The development will significantly increase traffic in an already congested area. The proposal is to create a "community hub" with a wider range of sports and activities". As far as I can see, the only proposed "sport" is a continuation of bowling for a club with a limited number of permanent members which has failed to attract substantial numbers of new members from the local community. There are world class bowling greens close-by at Kelvingrove (which has benefited from the Commonwealth games legacy). It is such a shame that the tennis courts have been allowed to fall into a state of disrepair: tennis popularity is surging across the country, and private and council facilities in the area are well used throughout the year. I for one shall be objecting strongly to this proposal. I utterly fail to see how this development is remotely sympathetic to the surrounding architecture. It could just as we'll be beamed in from outer-space. The Tennis courts in question have been allowed to fall into disrepair by the Bowling club in a cynical attempt to sell the land off. The club, as far as I can ascertain, having lived 100 yards from it for 20 years has little or no connection with the current local residents. If they are incapable of making a go of it financially then perhaps they should pass the land back to the community from whence it came. I'm sure the local community can come up with something much more productive than Lego flats. Allotments et etc , I will be strongly objecting to this asset stripping exercise. It’s vital for planners and architects to protect green spaces- particularly within conservation areas and to protect the views of surrounding listed buildings and encourage biodiversity where possible. Unfortunately this development does not appear to have fully considered or respected the surrounding environment, wildlife or architecture- creating housing on allocated leisure space and blocking the view of the remaining green space. It’s important to listen and to support the community’s well being, enhance amenities and retain sports ground where possible. Looks a like a sensitive, sensible and appropriate piece of townscape/architecture. Unfortunately I see the west end NIMBYs are foaming at the mouth, desperately trying to come up with reasons to object. No doubt some Crocs wearing yoghurt weaver will fling some wildflower seeds in and try to claim it's a "meadow" within a few weeks. As a local resident I don’t see this as a choice between this development and no development. The club’s finances are in dire straits and the clubhouse and bowling green itself needs upgrade and repair which the club cannot presently afford. If the whole club falls (as is possibly the case given the condition of the wall onto Partickhill Avenue) then there is a fair chance the whole site would need to be sold. There are such a huge number of green spaces in close proximity (Hayburn Park, Dowanhill Park, Kelvingrove Park, The Botanic Gardens) that this isn’t a choice between maintaining the status quo and the present application -this is between potential development of the whole site within a few years and this application. These aren’t lego flats – they are six very generously sized houses with their own designated parking of 1.5 spaces per house designed by one of Scotland’s best architects. And there is always parking space on Partickhill Avenue. 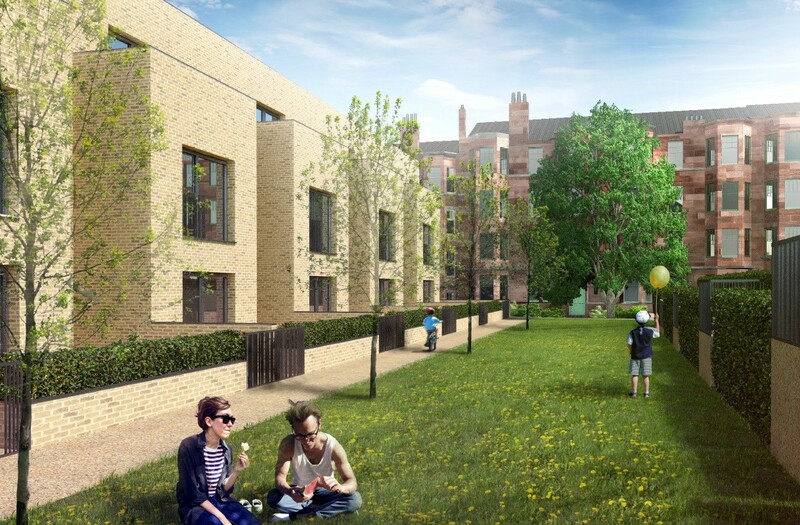 The brick reflects what is already used on Hillside Gardens Lane and the development pattern follows that of the Accordia Development down in Cambridge – i.e. minimal private gardens with most space turned over to the public/semi public areas. To my mind, therefore this is an easy choice – this application is a far more appealing than the whole site being developed. I don’t doubt that the club needs to diversify it’s appeal and tennis may be one way of doing so, but at the moment the financial straight-jacket it is in means it can do neither. This application means that 85% of the green space (which I could hardly call amenity at the moment given it’s condition) is retained and upgraded and there is money and time to try and turn this into the community hub that it is clear the residents so badly want. The appropriateness of a buff facing brick is questionable. That aside, this appears to be a relatively considered and restrained proposal which is no doubt better than the typical developer fare that might otherwise end up being built. I was disappointed by the designs. Recent developments in the surrounding area have been more sympathetic to the existing structures. I think these designs do not display innovative contemporary architecture, nor do they complement the existing tenements. I also fear for the motivation behind them. The bowling club is unsustainable. Any suggestion that renovation will increase the number of playing members to sustainable rates (and therefore protect the club's future) is unfortunately naive. The demand for bowling clubs is falling at an even faster rate than local bowling clubs are closing. This is a shame. When the bowling club eventually closes I will be gutted. However this development, or the next one, will not protect it. Therefore it seems a bigger shame to destroy a remaining stretch of green space in an already urban built-up area for such a short-sighted aim. Council policy expressly forbids building on green space. However within a few blocks from this site the council are currently violating their own policy: building on 3 green areas (one of which used to be a cemetery!) I have no doubt that the council will allow this development, but if they do, I think there needs to be serious scrutiny into the motives for their action. The council cannot say one thing and repeatedly do another. At some point the council need to take action and start protecting the few remaining green spaces. It very simple really. The club's dire financial state is entirely of its own making. It was they who neglected (willfully maybe?) the tennis courts and then said it was all the fault of the locals for not joining. When 80 application were received some 1o years ago they first rejected them on a technicality and then allowed them, but not before changing the rules so that we couldn't vote. They would not seriously consider plans to revive tennis or consider any other options. They didn't send renewal notices and slowly the new members drifted away. They are back down to 20 playing members which is not viable, even with a renovated club house and green. There are alternatives. If it becomes a meadow I might even buy crocs. As for the 'garden' shown in the picture, it's a 4 metre strip of grass for the use of club members and residents of the proposed houses. The club believes local residents will flock back to enjoy this garden. Which is a measure of how much of a grasp they have on reality. Deary me .. the vesting interests are out in force. At least make some attempt not to troll you greedy muppets. With regard to Crocs and Yogurt again make some effort on the cliche front please. If you're going to insult people, have the wit and where for to use your own. And hardly a good choice of name to troll: do Gareth Hoskins really wish to be aligned with an American Psycho?